Eurasia Motors is the official dealer of Princess, Brig, Quicksilver, Sea-Ray, Bayliner, Beneteau and Zodiac Milpro boats and yachts in Kazakhstan. Our company is the official dealer of Princess, Brig, Quicksilver, Sea-Ray, Bayliner, Beneteau and Zodiac Milpro boats and yachts in Kazakhstan. A yacht is your persistence. It embodies your lifestyle. Its main mission is to make you, your family and friends truly impressed. Each Princess yacht is designed and created by our experienced specialists using the most modern technologies, collected with careful attention to details. You can dissect waves at high speed or peacefully rest in your favorite bay - everywhere you will have your yacht exceptional luxury and individuality with its design and every inch detailed elaboration. Beneteau is today's one of the oldest yacht yards. Founded in 1884 for the sake of trawlers construction, 80 years later it has started building sailing and engine yachts. Absorbing a number of other competitors, in particular, Jeanneau and CNB, the company became the largest yacht-building company in the world. Before the crisis, it had been producing a total of about 4,500 sailing and engine vessels per year. Beneteau positions itself as a mass manufacturer with the most favorable price-quality ratio, carefully following its customers' wishes. The last three years (2009-2012) company's life were marked by a radical revision of its produced ships lines (especially in the case of sailing yachts), some changes in the market strategy (due to changes in the company's management) and fight assembly's quality. Some of the Beneteau's design solutions (for example, the arc for the gika-sheet race on sailing yachts) have no analogues yet on the mass European yachts. BRIG is the largest RIB boats manufacturer (inflatable boats with a hard bottom) in Europe, which are sold in more than 40 countries. PVC made Inflatable BRIG boats are a high level of comfort, excellent seaworthiness and unique reliability. BRIG pick-up boats are easy to transport , they do not require special storage conditions and any preparation for operation costs. The BRIG hard bottom boats are designed for sea walks, entertainment and professional use, they have a large carrying capacity and useful area in the cockpit. Quicksilver brand is part of the private American corporation Brunswick along with such well-known brands as Bayliner, Boston Whaler and Sea Ray. Being one of the world leaders in the production of small pleasure craft, Brunswick Marine uses high industrial standards, and with Quicksilver it is not an exception. Two shipyard models include fiberglass boats for recreation and fishing 3-10 meters long, designed primarily for outboard engines with the possibility of trailer transport transportation. The Activ line up includes mostly open cabin boats and bowers for daytime family time, and the Captur line up is addressed to those who need a complete isolatation from the outside world running chute and a wide universal cockpit with the possibility of installing fishing equipment. There are very simple budget boats Captur Fish in a shipyards arsenal, designed for beginners and fishermen who walk in the inland waters near the shore. The eminent industrial designer Karsten Astheimer put his hand on creation of a number Quicksilver models, he is known for working with Sealine, Ferrari and Alfa Romeo brands. High quality manufactured, practical and seaworthy boats Quicksilver was repeatedly nominated and won at the prestigious world yacht competitions, including Motor Boat of the Year and Power Boat of the Year. At least one Sea Ray boat will be found in any world marina: these American boats are practical and inexpensive; quite good, though without any special frills. The attractive price is explained by a super-mass production: if the European "serial" shipyards annually issue hundreds of hulls, the Sea Ray does more than 10 000. Only in the USA the company has six plants reminiscent of conveyor production of cars: pre-assembled systems and interior blocks are stacked in layers, all this is covered with deck and superstructure. 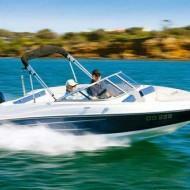 The model range of Sea Ray is very extensive - about 40 models, divided into 4 series. Sport Boats are open sports boats from £ 19 to £ 30 in length, available both as bowers (with an additional cockpit in the bow) and with a bow cabin below deck. Sport Cruisers (24 - 37 lb.) - weekend boats with a pair of cabins and an open cockpit. The line Sport Yachts (41 - 51 lb.) 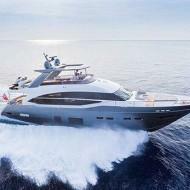 - sports boats with a hardtop, and Yachts (52 - 61 lb.) 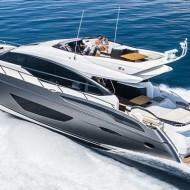 - the largest models with a hardtop (Sundancer) or flybridge (Sedan Bridge). Initially taking the course for the production of simple, light and technological buildings, the shipyard very soon began to increase the production of inexpensive bounty hunters, sports boats, cruisers - that is, popular with the ordinary buyer of "people's boats." Rustic design, some flaws in their ergonomics and layout were compensated for by considerably less cost compared to competitors, which was quite acceptable for young and unpretentious tourist fishermen. In 1986, Bayliner joins the Brunswick Corporation, one of the largest shipbuilding corporations covering the market from small boats and motor yachts (Bayliner, Sea Ray, Hatteras, Meridian, Boston Whaler) to large cruise ships and trawlers. Bayliner is headquartered in Lake Forest, Illinois. Production facilities are located in Paipston (Minnesota), Rozburg (Oregon), Cumberland (Maryland) and Reynosa (Mexico). Like half a century ago, the shipyard is still engaged in the production of small (from 6 to 11 meters) and relatively inexpensive cruisers, sports and fishing boats. Produсing almost 30 000 units a year, the American shipyard today is an indisputable leader in its segment of the market.